Perfect for when you need to introduce more than one colour into your room. Remember the kaleidoscope toys you loved staring into as a child? Now you can savour those bewitching patterns in grown-up textile form. We love the sharp style and eye-tricking designs on this cushion, hot from the loom of Edinburgh textile maker Nicole Scott. 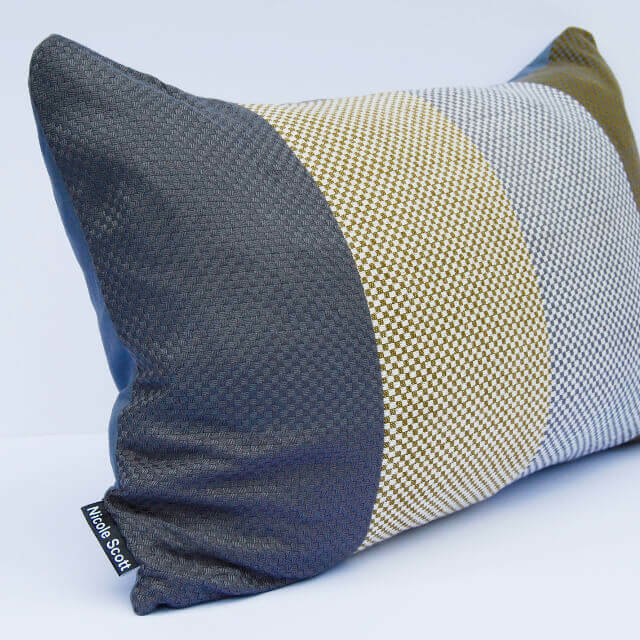 The design was inspired by Nicole’s own hand-drawn geometric images and she created the fabric by combining two different patterns and colours in the warp with a black yarn weft. It was woven on a 16-shaft dobby (as opposed to treadle) loom using soft viscose, which gives the fabric a beautiful glossy finish. Once off the loom, the fabric is assembled and filled with downy duck feathers for maximum comfort. Textile designer Nicole graduated from Edinburgh's Heriot Watt University in 2014 and took her acclaimed degree show to New Designers in London and the Pop Up Scotland exhibition. Her training included experience in the studio of another CDH talent, weaver James Donald and with fashion textile maker Margo Selby. In 2015 Nicole bought her own loom and set to work designing unique fabrics and cushions inspired by geometric designs, architecture and optical images. She uses photos of her own fabrics and hand-drawn artworks to create kaleidoscopic images which go on to inspire new designs. Craft Design House is delighted to showcase the work of emerging talent like Nicole and help new designers find an audience for their work. Pattern is key for Nicole, who enjoys pushing the limits of weaving by creating as many shapes and patterns as possible on the loom. Colour also counts – Nicole found that designs ‘played with her eyes’ as non-existent colours began to appear in her hand-drawn monochrome images, created simply by the depth of her patterns. 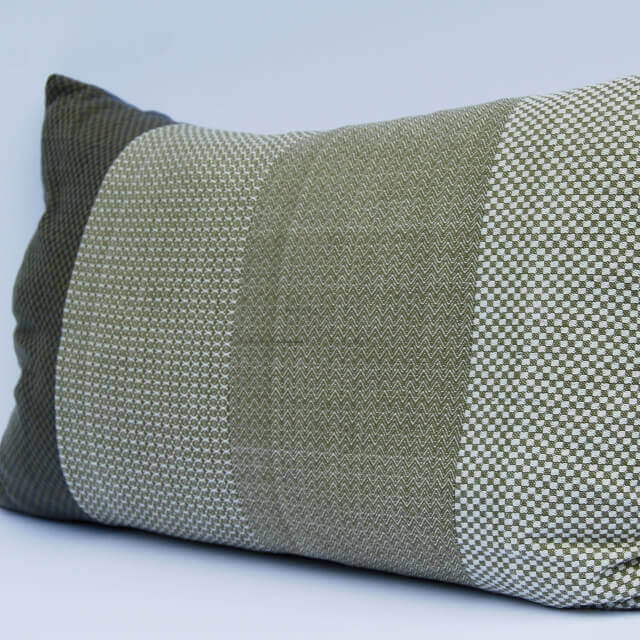 She creates high quality hand woven cushions from viscose, a very fine yarn that gives a luxurious glossy look and feel, and works well with smaller patterns. 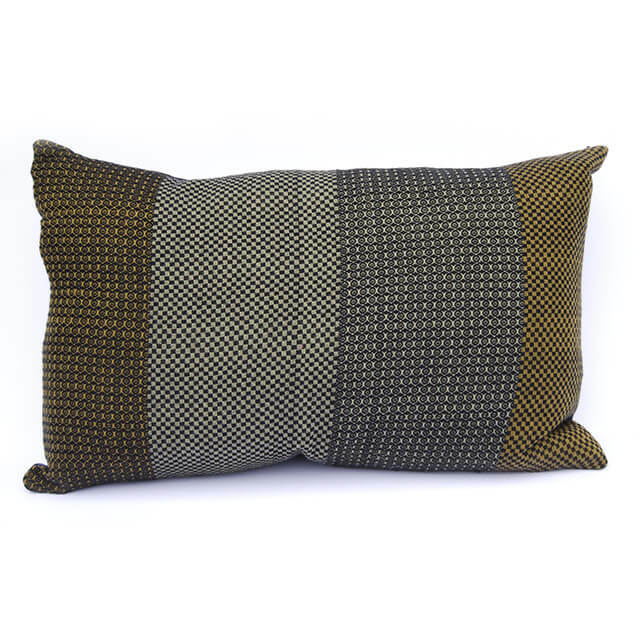 Her other favourite is soft lambswool which she uses to make cushions in more muted colours with bold larger-scale patterns.